Crafting recipes are items you create that are essential to surviving in Minecraft. Certain in-game items are only available through the process of crafting. This feature of the game allows you to do important things like collect appropriate blocks for building, obtain armor or weapons, make food to battle hunger, create redstone mechanisms, customize items through the use of dyes, and more. To craft in Minecraft, you need to collect ingredients and place the materials in the appropriate pattern in your crafting grid to create your item. Every player has a 2×2 crafting grid, accessible through the inventory screen. However, you can also obtain a crafting table, which is a 3×3 crafting grid and allows you to leverage more advanced recipes. There are thousands of Minecraft recipes available in the video game, especially when you think of all of the similar but unique materials used for customizing items. For example, while there is a primary firework crafting recipe, it can be slightly altered depending on the ingredients used to customize colors, shape, and effects. Fireworks are a fun item in the game, but not an essential. Below are ten of the most useful crafting recipes for your adventure to help you ensure survival and guide progress throughout the game. The torch is a common block that is used to light up dark areas. This can be great for lighting up caves and houses, for instance. Many types of mobs and other monsters are afraid of light, and will avoid the light of a torch. So, a torch is particularly powerful in a mine. The torch recipe requires the following ingredients: 1 stick and 1 coal. To make a torch, place the coal directly above the stick in your crafting grid. 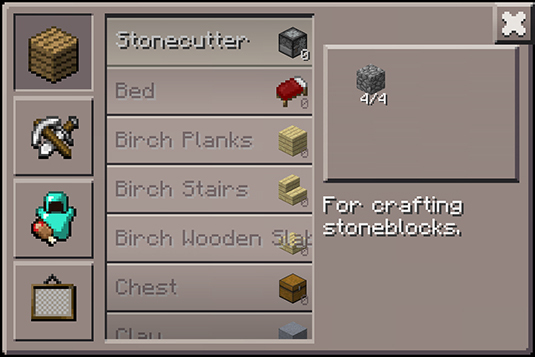 Unique to Minecraft PE, the stonecutter is like a second crafting table. It is used to craft anything out of cobblestone except the furnace, tools, and the stonecutter itself. It also used to craft other stone-related items, such as stone bricks and stone stairs. The stonecutter recipe requires the following ingredients: 4 cobblestones. To make a stonecutter, place the 1 block of cobblestone in each of the first four boxes, in a square format (starting from the top left box). The bow and arrow are weapons in Minecraft that inflict different amounts of damage depending on how much the bow is charged. As the bow charges, the string pulls further back. The more charged up the bow is, the farther the arrow goes, the stronger the arrow gets, the slower the player moves, and the more zoomed in the camera gets on the target, greatly improving the accuracy of your shot and the amount of damage your arrow will inflict. Bows and arrows also allow you to shoot at mobs from a safer distance than using a melee weapon. Learn more how to make and use a bow and arrow. The rare Golden Apple not only restores hunger points but also provides 2 health bar hearts. Consequently, this is the one food that can be eaten even when a player is at full hunger points. They are also used to cure a zombie villager. Think of this as the superfood in Minecraft. The golden apple crafting recipe requires: 1 apple and 8 gold ingots. To craft, simply place the apple in the middle box of your crafting grid with the gold ingots surrounding it. The primary use of a fence is to keep animals in and mobs out. Fences technically only take up one block space but function as 1-1/2 spaces in height preventing players and mobs from jumping over them (except spiders). Proper lighting inside a fenced area also limits mob attacks. Meanwhile, fences keep animals contained so players can farm them effectively. Learn more about Minecraft fences. TNT is the only explosive block in the game. Lighting it on fire will set it off. It will flash between a white texture and the normal texture, after the white texture has been seen eight times, it will expand quickly and explode. TNT becomes a powerful tool to clear land quickly (including mining) and to blow up hostile mobs. It is also a ton of fun and frequently featured in explosive contraptions such as TNT cannons. Fishing rods are far more useful than most players realize. Obviously, their primary use is to catch fish, which are abundant and provide a good source of food. But fishing rods can also catch junk or treasure (just as in real life). The crafting recipe for fishing rods require: 3 sticks, and 2 strings. To craft, place these items in the exact positions of your crafting grid as seen in the image below. Boats are easily crafted from wooden planks and move much faster on water than a player can walk. They will float along a current and can be controlled by a player. They are essential in an Ocean biome. Because they are easy to craft, boats are often a player’s first transportation system (outside of walking of sprinting). However, they break easily and are not suitable for all biomes. The crafting recipe for boats simply require 5 blocks of wood, such as oak. To make a boat, place the blocks of wood in U shape in your crafting grid. Anvils are very useful in Minecraft to repair items without breaking the enchantment. They also can combine enchantments and rename items. Anvils are more complicated than crafting tables, and require experience points (earned by completing tasks in the game) and materials in order to repair and item. The crafting recipe required for an anvil includes: 3 blocks of iron and 4 iron ingots. To make an anvil, place the 3 blocks of iron across the top row of your crafting grid. Put 1 iron ingot in the middle box, and then the remaining 3 across the bottom row. A piston pushes most blocks when activated up to 12 blocks away. Pistons are commonly used to open and close doors, create traps, and are used in all types of redstone creations. A unique feature of the piston is that it will extinguish a block that is on fire. The piston recipe requires: 3 wooden planks, 4 cobblestones, 1 iron ingot, and 1 redstone.